Prof. Gissurarson at Manhattanville College. 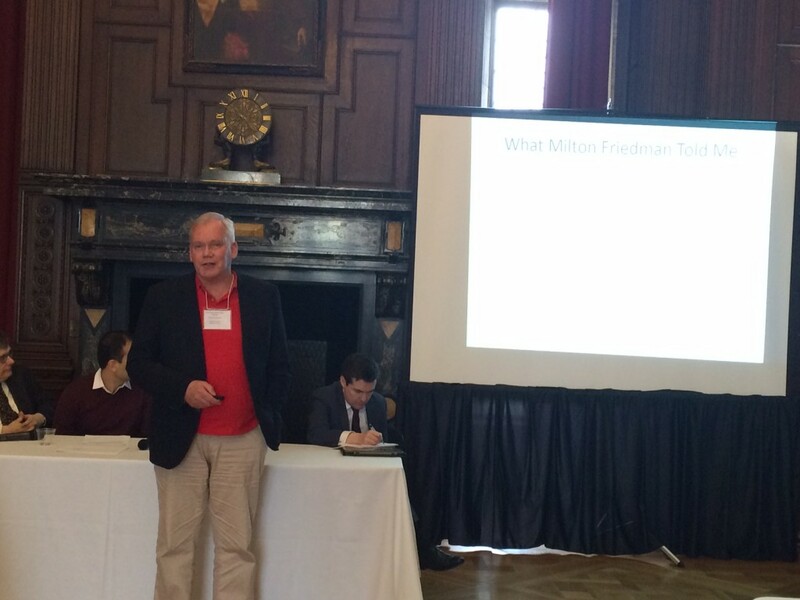 RNH Academic Director, Professor Hannes H. Gissurarson, gave a lecture at a conference on economic freedom in Manhattanville College, Purchase, New York, 8–9 April 2016, on economic freedom in Iceland 930–2016. He discussed the institutions of the Icelandic Commonwealth, including the choice between chieftains (or protection agencies), and grazing rights in the mountain pastures which solved to some extent the common pool problem. He also tried to explain why the Icelanders suffered hunger and famines for centuries even if there was plenty of fish in the Icelandic waters. Furthermore, he analysed the Icelandic system of individual transferable quotas in the fisheries which has made them both sustainable and profitable, unlike fisheries in most other countries. Last year, the University of Iceland Press published Professor Gissurarson’s The Icelandic Fisheries: Sustainable and Profitable. Finally, Professor Gissurarson briefly compared the market capitalism developed in Iceland in 1991–2004 and the crony capitalism replacing it, contributing to the complete collapse of the banking sector in 2008. At the conference, Professor Gissurarson participated in a panel on money and central banks with Dr. Warren Coats, former head of the SDR (Special Drawing Rights) section of the IMF, Dr. Arthur Gandolfi, former Citibank Vice President, and Professor James Lothian of Fordham University, who served for two and a half decades as Editor of the Journal of International Money and Finance. Professor Gissurarson gave an account of his experience as a member of the Overseeing Board of the Central Bank of Iceland in 2001–9 and shared his conclusions about the proper monetary order for a small and open economy like Iceland. Gissurarson’s participation in the conference formed a part of the joint project of RNH and AECR, the Alliance of European Conservatives and Reformists, on “Europe, Iceland, and the Future of Capitalism”. Prof. Lothian of Fordham, Dr. Gandolfi of Citibank, Dr. Coats of the IMF og Prof. Gissurarson. Lothian and Coats both received their Ph.Ds in monetary economics under Milton Friedman.